Welcome to Nationwide Furniture Outlet! Our Company offers almost every furniture style you can imagine! We sell Modern Furniture from Italy, Spain, Belgium and other countries. You can find an amazing variety of Living Room Sofas and Leather Sectional Sofas, Modern Bedroom Sets, and a large choice of Coffee Tables! Take advantage of our huge selection of wholesale priced closeouts! 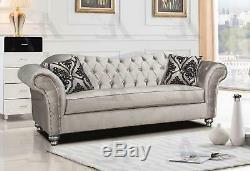 Silver Fabric Tufted Sofa American Eagle AE2600-S. Rolled arms with classic nail head trim. Wood sofa legs with black finish. All corners are blocked, stapled and glued for strength and durability. Note: Real color of the product may slightly differ from the image. We strive to carry quality brands and deliver your new furniture in perfect condition. If you need service on furniture, we will do everything we can to help you. There will be a note in the literature that comes with your new furniture that will direct you who to call in the event that service or replacement is needed. We will do everything we can to make sure you are satisfied. When the packaging has visible imperfections that may or may not affect your merchandise inside. Always take your time to inspect your product packaging disregarding if driver is in a hurry etc. Refusal to cooperate will void the damage claim. We will arrange for a repair or, if necessary, replacement or replacement parts to be rushed out. We will take the quickest route to remedy the situation. We bring the merchandise to the original condition by ether repairing to your 100% full satisfaction or partial or full replacement. Concealed damage in intact packaging. After the report rules for visible damage apply. No matter what type of damage occurred please save the packaging. Discarded packaging will effectively void the claim. For items that are custom ordered, there are no options for cancellation. Custom order sale is final, no exceptions. Please be careful when ordering your furniture and let us know if we can be of assistance in selecting the right furniture for your situation. Always measure the space you are placing the furniture. We do our best to accurately show the finish colors of each piece we carry, however colors can vary by personal perceptions, monitor type and age, video card differences and printing variations therefore exact tone match is not guaranteed. Truck Curbside Deliveries (default option). It is a service when the truck will deliver to the closest truck accessible area and the merchandise will be unloaded from the truck by the driver using the lift gate to the ground level. Common carrier deliveries are only performed Monday through Friday. Checking merchandise condition is customer's responsibility. The driver will not allow you to unpack the packaging to inspect the merchandise, but you are only signing for intact packaging, not the product. Therefore please take your time and inspect every inch of it. Please take your time and inspect the merchandise before signing for perfect condition. The item "Silver Fabric Tufted Sofa American Eagle AE2600-S" is in sale since Thursday, December 15, 2016. This item is in the category "Home & Garden\Furniture\Sofas, Loveseats & Chaises". The seller is "nationwide*furniture" and is located in Rowland Heights, California. This item can be shipped to United States, Canada.